Scholars have studied this question intensively, and, while there are many uncertainties, these are relatively minor and some clear conclusions can be drawn. The New Testament contains 27 ‘books’ that were originally written quite separately, all in the first century CE. It was only compiled into the volume we call the New Testament several centuries later. Jesus probably spoke in Aramaic, but the Bible was written in Greek. The original documents were written in the period from about 45 CE to 95 CE, in ink on papyrus, and such documents don’t last very long. Copies were made by hand, and copies made of the copies, and so on. Eventually the originals perished along with many of the copies, and the text is constructed from the surviving copies. More than 5,600 Greek manuscripts of part or all of the New Testament have been discovered. The earliest of these (a few verses from John’s Gospel) is often said to date from about 125 CE plus or minus 25 years, which is possibly only 30 years after it was first written (however it may possibly be somewhat later, say mid second century). The earliest complete New Testament manuscripts date from about 350 CE, with complete copies of most books somewhat earlier. In addition, there are around 20,000 manuscripts in Latin and other languages. Most of the copies we have are, naturally, more recent, from about the 10th to the 15th centuries when printing replaced manual copying. This is an unprecedented number of copies, and no other ancient writing comes anywhere near it. The closest is Homer’s Iliad, with almost 1,800 copies. For most classical works, only a few hundred manuscripts survive. The gaps between the original and the earliest copy are typically hundreds of years compared to about 40 years for the New Testament. When a scribe copied a manuscript, mistakes could be made, or, occasionally, the text could be deliberately altered – perhaps to make something clearer, or to ‘correct’ or change the original words. These variations would then be carried through to subsequent copies. By comparing manuscripts from different parts of the Roman empire, textual scholars can check the accuracy of transmission and try to reconstruct the original text. Other things being equal, greatest weight is given to readings in the oldest manuscripts, the greatest number of manuscripts, and to readings which are considered least likely to have been changed – whether deliberately or by mistake. I have found it difficult to get clear consistent information on this matter, and there is some difference in the answers given by different ‘experts’. But here is the best information I can find. There are about 140,000 words in the Greek New Testament, and scholars estimate there are about 400,000 variant readings, or about 3 per word on average! However these variations are spread across more than a million pages of almost 25,000 manuscripts, so the number of variations is about one word every second page. The most common form of variation is spelling – minor mistakes by the scribe or the use of local spelling of place names and other words – which rarely make the meaning unclear. Gross mistakes – omission or repetition of words – also occur, but are generally quite obvious, and can be discarded. Sometimes the word order is changed, which might make a difference in English, but makes no difference to the meaning in Greek. A scribe may write a word that sounds like the word in the text, and thus change the meaning, but these errors too are generally easy to identify. A relatively small number of variations give different but plausible meanings, and in two cases add significant passages to what is believed to be the original text. 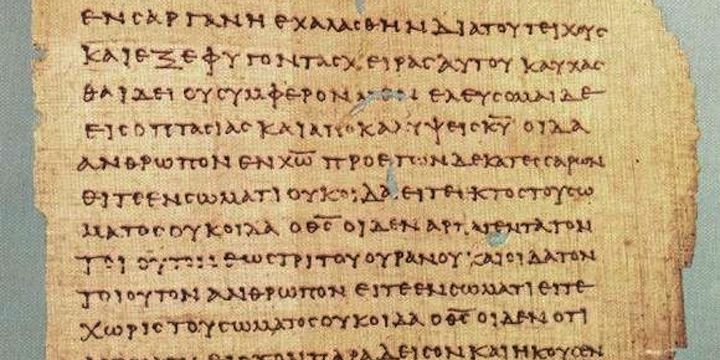 There are a number of standard Greek texts for the New Testament, where the scholars have chosen what they consider to be the most likely original text, though of course there are differences. These variations are generally marked in modern Bibles, with the text considered most likely used, and the alternative shown in a footnote. Different translations may use different Greek texts. To be sure, of all the hundreds of thousands of textual changes found among our manuscripts, most of them are completely insignificant, immaterial, of no real importance for anything other than showing that scribes could not spell or keep focused any better than the rest of us. Various figures are given for the overall accuracy of the New Testament text. It seems that 90-95% of the New Testament text is free of variation, and the significant variations affect less than 1%. The following discussion focuses on the small number of variations that change the meaning in a clear way. Two large passages are generally believed to be later additions to the original text, and are set apart and marked as such in most Bibles. They are John 7:53-8:11, where Jesus intervenes to stop a woman being stoned to death for committing adultery, and Mark 16:9-20, an ending of Mark’s gospel, which otherwise seems to finish abruptly. The words of Luke 22:43-44 ( An angel from heaven appeared to him and strengthened him. And being in anguish, he prayed more earnestly, and his sweat was like drops of blood falling to the ground. ) appear to be an addition. They are included in most Bibles, but a footnote explains that they may not be original. In addition, an extra 25 words (in English) appear to have been added to 1 John 5:7-8, apparently to give greater support to the doctrine of the Trinity. This has been known for centuries and most Bibles retain this section only in a footnote. In Mark 1:41, Jesus is approached by a man with a skin disease, who asks to be healed. The majority of texts say Jesus was moved with compassion but some texts say Jesus was angry . Hebrews 2:9 is generally translated so that by the grace of God he might taste death for everyone , but some manuscripts have one word different in the Greek, which would then translate as … apart from God he might taste death …. .
Manuscript copies of John 1:18 have several slightly different variations of two or three words. In essence, the difference comes down to whether Jesus should be called son of God or God . This is a significant difference theologically, although both translations presented highly exalted views of Jesus’ status. Modern translations are split between the two meanings. In Luke 2:33, the phrase the child’s father and mother marvelled … was changed in some manscripts to Joseph and his mother marvelled … , apparently to avoid any implication that Joseph was Jesus’ biological father. However the original is used in most Bibles today. We lose a much-loved story of Jesus in John 8. No teaching is affected, and christians are likely to continue to use the story anyway. The loss of the ending in Mark changes nothing, except removing the reference to snake-handling and drinking poison. Several verses which might once have taught the Trinity or Jesus’ divinity are removed or diluted. There is support for these doctrines elsewhere in the New Testament, but the case is slightly weakened. Jesus may have been angry in one more situation than previously thought. The large number of variations occur because of the extremely large number of manuscript copies. Thus scholars are in a good position to determine the most probable text in most cases. For most ancient documents, we do not have this luxury. It is hard to see that the uncertainties are significant, and most scholars affirm this. The late Bruce Metzger said: I don’t know of any doctrine that is in jeopardy . However some scholars, such as Bart Ehrman, believe that the textual differences prove that the Bible wasn’t inspired by God – for a God who inspired the Bible would surely have kept the copying without error as well so that his words were available to us. But most reviews of Ehrman’s work say he is over-stating the case. In any case, “inspiration” is a term that means different things to different people, and Ehrman’s suggestion that inspiration by God must imply no, or minimal, copying errors isn’t a view held by all christians. Textual variations may lead us to conclude that the New Testament we read is not ‘inerrant’, but the variations are so minor they have minimal impact on our historical knowledge and they should not disturb anyone’s faith in Jesus. Photo: A section of Papyrus 46 showing part of the book 1 Corinthians. P46 is dated about 200 CE and contains many of the New Testament epistles. (Wikipedia).